Here is a roundup of the 2018 Black Friday & Cyber Monday Nikon D3500 deals, sales, discounts and rebates. Compact, easy to use, and versatile are all traits of the Nikon D3500, which is designed to be as flexible and intuitive as possible, while still offering the imaging capabilities you expect from a DSLR. Featuring 24.2MP CMOS sensor, 100-25600 ISO, 5 fps burst speed, 1080p 60 fps video, and convenient features like Nikon SnapBridge and helpful Guide Mode, the Nikon D3500 is a perfect companion for any family event or travel adventure. Below will be a roundup of the 2018 Holiday Nikon D3500 Deals & Sales, along with Black Friday, Cyber Monday and Green Monday Nikon D3500 deals, sales, discounts and rebates. You can just follow the links below to get the Nikon D3500 deals. 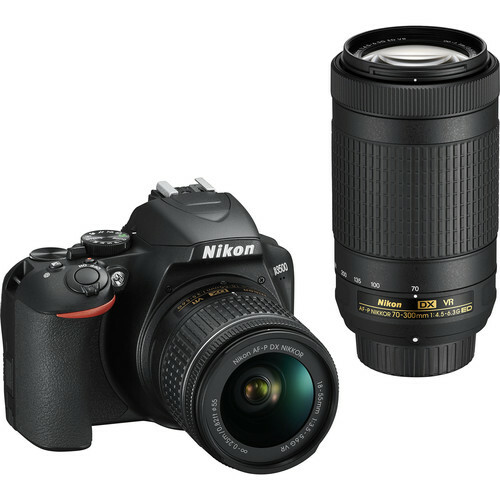 $350 off on Nikon D3500 with 18-55mm and 70-300mm Lenses: $496.95 at Amazon, B&H, Adorama. $100 off on Nikon D3500 with 18-55mm Lens: $396.95 at Amazon, B&H, Adorama.